Do You Have Strong IT Strategy? The traditional IT infrastructure model has reached its breaking point. In order to accommodate the growth of new devices, amount of data and security threats, IT infrastructures need to get smarter. TechHeights’s comprehensive portfolio of IT strategy and design services can help you optimize your infrastructure to better align with business objectives. We leverage best practices to develop an interconnected, intelligent IT strategy which will help foster innovation and move your business forward. Business Strategy involves a 360 review of the present IT, vision and objectives of the organization, with the goal that we can infer the suggestions for IT–what IT should be and do so as to support the business methodology. On the other hand, what competencies would IT be able to deliver to support the new business plans. During this analysis, we evaluate the present IT infrastructure and business applications. This provides indication about frameworks that are most important and are candidate for additional support, substitution, or redesigning. These measurements help us benchmark IT expenses and staffing levels, the adoption level for new innovations, and the condition of IT administration best practices. All businesses have backlogs of IT requests including IT infrastructure and application projects. In this progression, we assess those projects and requests to make sure that they are aligned with the business goals and strategy. Additionally, evaluate how they affect the present state analysis. In this stage we align business goals with IT strategy to future proof the business growth. The IT methodology includes envisioning the future state where IT infrastructure, applications, individuals, and procedures are completely adjusted for the business growth.  In this stage, the individual activities and phases of the IT strategy are outlined. These initiatives are put together to create a final road map to achieve the desired business vision and goals. It additionally incorporates budgetary estimates, and business cases for the significant activities expected to achieve the objective. Schedule your FREE 1hr consultation today !